Shifting business processes to adapt to new technologies. The long history of business is ripe with stories about companies who were leaders of their industry only to fall rapidly because of a failure to shift their business model or processes when new technologies entered the game. IBM once dominated the computer industry without a close competitor during the golden era of mainframes but somehow completely missed the boat when micro and personal computers started making waves. Small digital camera manufacturers refused to accept that people would rely only on their phones for quick family pictures until it was too late when the era of the ‘selfie’ took hold. The lesson in these stories is about accepting, understanding and adjusting to new technologies and shifting business strategy to embrace the potential that these new ideas can deliver. There are new technologies being absorbed into nearly every industry in the world right now including formerly “tech-free safe zones” like the Construction industry. Accounting and project management software is already making an impact on the way contractors of all sizes do business. Building Information Modeling (BIM) is now a requirement for construction in the UK and “punch list” software applications are ensuring every detail of a project is checked off for quality. These days, small and mid-sized, forward-thinking contractors are looking to quickly adopt technology solutions as a way to gain a competitive advantage over bigger slower competitors. The ability to quickly deploy an app on smartphones or tablets that solve issues on the jobsite is a huge advantage to smaller companies. So, how should construction businesses begin to make adjustments to stay ahead, be more efficient and ultimately reduce costs in a rapidly moving world of business technologies? A McKinsey & Company article titled: ‘Disruptive technologies: Advances that will transform life, business, and the global economy.’ by James Manyika and others, provides some of the best insight I’ve seen on winning the battle. The authors also advise keeping employees up to date on the skills needed to be ready to use or deploy the new emerging technologies. In today’s world this means enabling field employees to use smart phones for more than a calling and e-mail device. Bottom line is to be proactive and start looking at how your business will take advantage of new technologies to improve efficiencies and keep projects profitable. 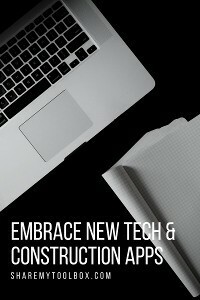 Complacent construction businesses need to understand that embracing new technologies is really about the willingness to shift and educate employees to incorporate the current technologies that can be used to your organization’s advantage. Often this simply means embracing the new and helping people through the learning process to see the advantages. Great example: Many contractors are saving time and money by utilizing tool-sharing applications that can be deployed on smartphones or tablets. Moving off of the old practice of managing tool inventories on Excel Spreadsheets, contractors are using these new tool-sharing applications to manage all aspects of their tool inventory. Most importantly, they are tracking tools as they move from job to job and person to person. This keeps accountability high and reduces the tool expenses for the business – making each project more profitable. Most companies see more than a 20% drop in tool expenses after implementing a modern tracking system. Clearly, adapting to and embracing new emerging technologies or ways of doing business can have a noticeable impact on a construction company’s bottom line. There’s no question that new technology presents definitive challenges to construction businesses, mainly because understanding and accepting these new technologies may require a need to adapt to new ways of operating. However to avoid being left behind, companies need to be agile at shifting strategies to adapt to the possibilities of new technologies. What technologies is your construction business looking into to improve processes, reduce costs or become more efficient? If something as small and simple as tool tracking can add to the bottom line then there is no reason not to get started today. Early adapters have the advantage. Reflecting on the examples presented in the beginning of this article, Polaroid is another case study worth looking at. Polaroid, the longtime leader in film, continuously tried to evolve to keep up with the rapidly changing camera technologies, always shifting its business two steps behind the competition and arriving late to the digital party. Meanwhile, smaller competitors such as Shutterfly built their business around the new digital camera technology. They merged the simplicity of new digital cameras with the reach of the Internet and started printing people’s photos for them. This launched a multi-million dollar business that Polaroid should have had the vision to create first. This is how small to mid-sized contractors need to be thinking in order to gain an edge on the competition. What can your small business accomplish with technology that keeps it one step ahead of the bigger, slower competitors? With construction technology still at a reasonably early stage, now is the perfect time to start evaluating the technologies that could improve your business and increase your competitiveness in a tight construction market. For more information on tool tracking technology please visit our Tool Tracking Tips page.